Fancy a drink? The two friends behind Quench have redesigned bartending tools, making serving up your favorite cocktails at home easier than ever. Slicing, muddling, zesting—the Bar10der does all of that and more. 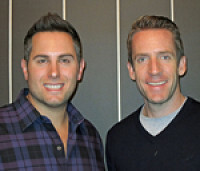 Co-Founders Josh Salles and Geoff Curley have packed the top 10 tools into one portable, bartending best friend. It streamlines the clutter from mixing up cocktails. Since we introduced the Bar10der a few years ago, the guys at Quench have continued creating smart helpers to turn any time into happy hour. Unwined is an easy-to-use corkscrew—no pulling required, just twist. 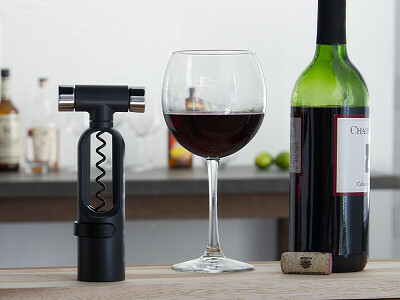 Tucked into the handle are a bottle stopper and an aerator, and the foil cutter is built-in, too. 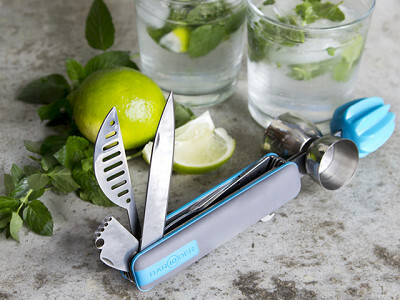 If you’d rather enjoy something tropical, there’s the Mojito Master, to chop and muddle mint. Or try the Ice Box Set—ice cube molds in unique shapes, suited for different drinks. These tools will make enjoying one—or two—cocktails at home an easier task. We say cheers to that. Hi, my name is Josh Salles, and I am the inventor of today’s Daily Grommet, the Bar10der. What is the Bar10der you ask? The Bar10der is the ultimate at home bartending tool. 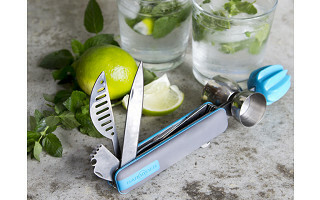 Complete with 10-tools-in-1 sleek design, you will never have to look through messy drawers again for a bottle opener, wonder what to do with a channel knife (or what it is for that matter), or run out and pay too much money for a muddler to make the perfect mojito. With the Bar10der, you have everything you need (in one cool tool) to make the perfect drink, at home. Cheers to that! Now let's chat! @ Jax Lady The 10 tools of the Bar10der if bought individually would cost close to $100. Never before has an entire set of bar tools been combined into one easy to use tool. @ janet Hi Janet, very funny! The actual Bar10der logo has a circle around the ten. I loved this concept immediately and imagined buying three - as great gifts for each of my children. The price point is too high and I ordered none. Sorry. @ ilb sadly I totally agree. I have two friends that would love this and I would love one for myself. Too bad. @ mhg Besides being less expensive than purchasing all of these tools individually or in a set, you'll never again be stuck fishing around cluttered drawers. Every tool you need to make the perfect drink is always at hand. @ ilb If you love making cocktails most sets on the market won't offer all the tools in the Bar10der and will be much more expensive. This is the only tool you (and your kids) will need, and what a conversation piece! I would buy this for the name alone...very clever! @ Elisa Thanks Elisa. Cheers!